Hello all! I'm posting over at Twine It Up! with Trendy Twine. Today I have a quick card I made using Twisted Lime Trendy Twine and the Twisted Lime Sequins. This is a pretty simple card. 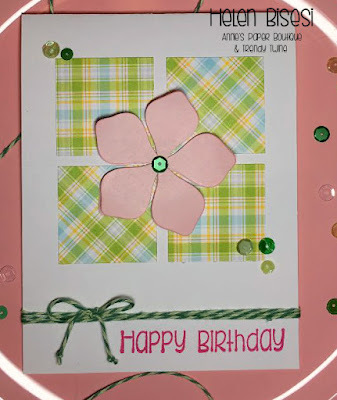 It was a pre-designed card on Cricut Design Space but with a shamrock. I went with a flower instead since we are past St. Patrick's Day. Besides the flower, I changed up the location of the squares so I could put my Twisted Lime Trendy Twine at the bottom and to add a stamped sentiment. There are two flowers one on top of the other. The top flower is curled a bit and I inked the edges. And there are pop dots in between to give a it of dimension. I finished it off by adding some Twisted Lime Sequins. Such a sweet card... love the flower front in center! Very Spring-y! This card is so pretty! I love the spring theme you went with. So pretty Helen! I just LOVE the colors and that pretty pink flower! 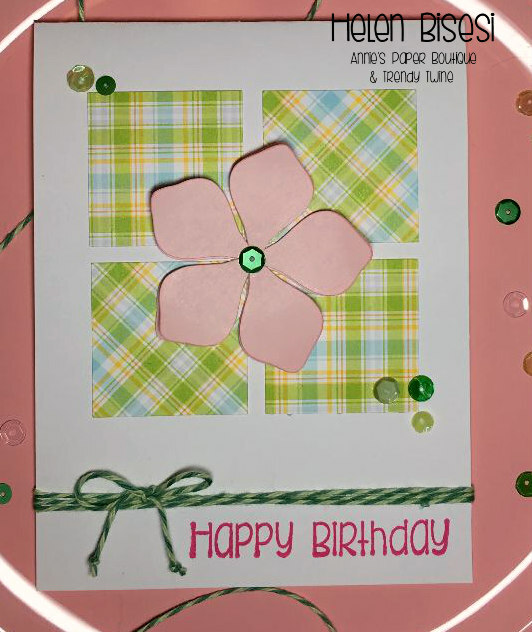 What a beautiful flower and a pretty Spring card. And I've always loved pink with green.